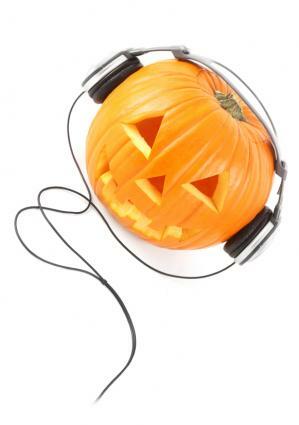 Music always sets the mood, and Halloween party songs can create a spooky atmosphere for any party. Get everyone singing along to some catchy tunes or inspire your guests to hit the dance floor with a fun Halloween playlist. Halloween songs can be silly or scary. They can help get the crowd moving at your party and can also break the ice. Add some of Halloween favorites to your playlist to keep the party going. Some songs to consider include the following. The Monster Mash is a classic oldies song that tells the story of a Frankenstein-like monster starting a new dance sensation. To get the dance floor hopping, teach young partygoers how to do the mashed potato with stiff, monster-like arm movements. Thriller is an instantly recognizable Halloween song. Watching the original music video can be a fun Halloween party idea. Learn the dance steps to Thriller and get the whole group in zombie motion. Time Warp isn't a scary song in its own right, but as one of the most famous songs from The Rocky Horror Picture Show, it practically screams Halloween. The accompanying dance is fun to perform in a group. Play the scene from the movie to help guests learn the steps, or screen the entire film as part of your party activities. The Addam's Family main theme song is a cute and catchy tune. It's the kind of song everyone will love to sing along with. Ghostbusters is another piece of theme music that is more fun than frightening. Guests are sure to shout along with the chorus. A Nightmare on My Street is homage to Nightmare on Elm Street, with the narrator running from "Fred." Thanks to the light and breezy style of D.J. Jazzy Jeff and the Fresh Prince, even partygoers who don't normally enjoy rap music may be drawn into the story. Wee Sing for Halloween is filled with age appropriate music. The Witch Doctor is another classic song that's great for singing along. Despite being released purely as a novelty track, Purple People Eater has endured for decades as a light-hearted monster tune that kids will love singing along to. I'm Your Boogie Man, the original disco-era song from K.C. and The Sunshine Band, is only tangentially related to Halloween. It mentions a boogieman, but the lyrics don't actually refer to a frightening mythical figure. However, White Zombie's 1996 cover truly gives the tune a creepy edge. Living Dead Girl by Rob Zombie offers a perfectly ghoulish theme for your celebration and it will keep the hard rock fans happy. Although not "music" per se, scary sound effects tracks are a popular choice for Halloween celebrations. With screams, howls, clanking chains, bubbling cauldrons, and more, they provide the perfect soundtrack to your event. Another non-musical option to play at your event is an audio recording of a ghost story. Check your local library for options, and gather the guests around to enjoy a spooky tale. Whether you choose fun, kid-friendly tunes, atmospheric instrumentals, or heavy rock songs, adding music to your Halloween party plans is sure to enhance the celebration. Both kids and adults will enjoy dancing and singing to the tunes for hours!